A few years ago, I made the jump from a Windows computer to a Mac. At that time I was freelancing, running from meeting to meeting and traveling a lot – so I needed the perfect combination of size, weight and battery life. The solution was a basic MacBook air. There was a problem, though. To get what I was looking for, I had to sacrifice the hard disk space. I had to choose between the 128 GB and 256 GB versions, both of which were suboptimal. I had used Dropbox before that and I knew that it wasn’t an option. Back then they didn’t have selective sync, so I had to either pretty much keep everything on my computer anyway, or struggle with the fact that it took quite a while to get to my files in the cloud. 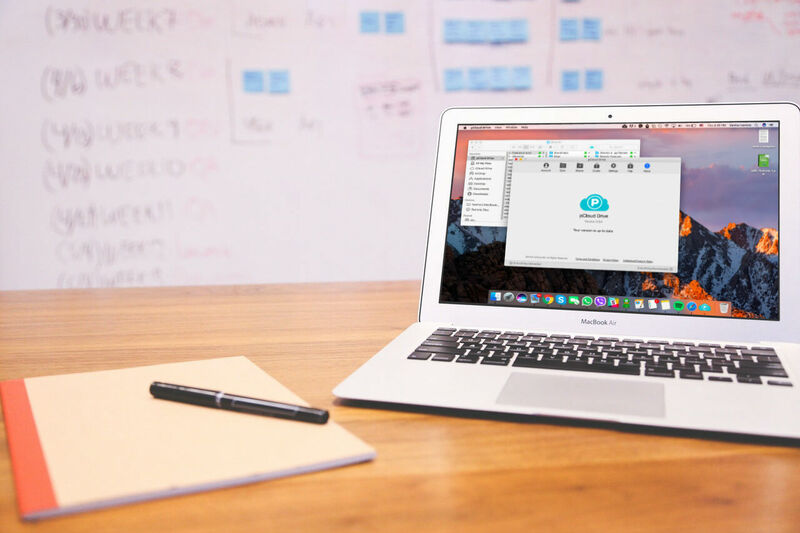 This is why I had to find an alternative solution and I came across the pCloud desktop app, pCloud Drive (and that happened way before I joined the pCloud team). To date, I still use a 128 GB MacBook Air, and I don’t really need to upgrade to a bigger SSD because I use pCloud Drive as a virtual hard disk. It’s true that I still need to be connected to the internet to use it but I have access to Wi-Fi most of the time anyway. Whenever I need to access and work on a file, I double click it and it opens straight away. You would expect that it would take some time since the file is stored in the cloud and not locally. However, with the practically unlimited download speed supported by pCloud, the file opens as quickly as the items I keep on my laptop. The same goes about uploading files. The speed for adding files to the cloud is capped to 80 MB/s for Premium and Business users and 40 MB/s for those on a Free plan. Well, I use the word “capped” loosely here: the average internet connection speed in the US was approximately 55 Mb/s, or about 6.9 MB/s. Put simply, your internet connection would really need to be impressive for you to hit the pCloud upload speed ceiling anyway. Explained even simpler, we practically have no upload size limit. But what happens if I’m not connected to the internet? Getting offline happens even to the best of us, but pCloud has this neat little option that allows you to sync files or folders for offline access. In that case, of course, the synced data takes up space on your computer – but unless you’re syncing your entire pCloud content, you’re still saving loads of space on your system disk. Another thing I just love about pCloud Drive is that it’s a part of a service available on all sorts of devices. This means that as soon as I snap a photo or shoot a video with my phone, for example, it’s immediately available on my computer. Or, I create a presentation for a meeting, save it to the web version of pCloud at the office and can edit it at home later that day so it’s perfect for the meeting. On top of that, I have a Premium Plus account, which gives me 2 terabytes of storage space. I usually work with text and PDF files and photos that are not huge. What takes the most space on RAW files from my photography projects, and even with them, I can’t quite utilize all the storage that I have at my disposal. If you are not a designer, photographer, video producer or an architect for example, and you don’t have to work with huge files, it would probably take you about a decade to fill 2 TB of space.